Raphael is a dumpsite boy. He spends his days wading through mountains of steaming trash, sifting it, sorting it, breathing it, sleeping next to it. Then one unlucky-lucky day, Raphael's world turns upside down. A small leather bag falls into his hands. It's a bag of clues. It's ... read full description below. Andy Mulligan was brought up in South London. He worked as a theatre director for ten years, before travels in Asia prompted him to retrain as a teacher. 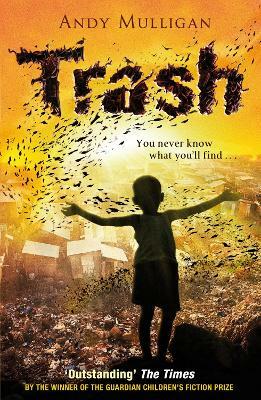 He has taught English and Drama in Britain, India, Brazil and the Philippines.Andy's novel Trash has been published in twenty-two languages and is now a Bafta-nominated major film directed by Stephen Daldry and scripted by Richard Curtis.